When taking close up, or macro photographs it is worth considering the use of a dedicated macro ring light flashgun, especially when using a dedicated macro lens. In this article we cover the use of a ring flash for use with a macro lens, and the subsequent benefits of using flash as opposed to natural light. Typically when using a dedicated macro lens the depth of focus is severely restricted, (the depth of focus can sometimes be measured in millimeters as opposed to inches, feet or meters. As a result it is necessary to stop down the aperture in order to increase the depth of focus i.e. F16, F22 etc. This in itself can cause problems with shutter speeds and possible camera shake and the need for to increase film speeds. This is where the use of flash can help - providing additional illumination, overcoming camera shake (by using a faster shutter speed for synchronization of the flash) and negating the need for faster film speeds, providing noise free images. When using flash for close -up / macro use it is advisable to look at using a specific model as opposed to a conventional flashgun, in this case a ring flash. 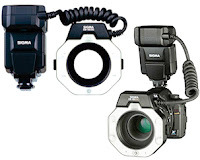 A ring flash consists of two parts, the unit that connects to the camera hot shoe and a separate circular tube connected by a cable. The purpose of the ring is to ensure even, shadow free illumination of the subject - achieved by mounting the ring flash to the front of the lens and effectively shooting through the ring. The use of a ring flash also helps add depth to the subject with an almost 3 dimensional effect. When used with the camera, the ring flash will work with the TTL (Through The Lens) metering system, delivering the correct amount of flash light for the given subject regardless of how close the subject is to the camera. There are numerous variants of ring flash available, camera manufactures own, third party alternatives and even different methods of illumination from conventional flash tubes to constant LED lights. Of the two, conventional flash tubes provide a more pleasing and accurate exposure, the Sigma EM-140DG offers a very good balance of cost, build quality and functionality, and is regarded as an industry standard. The following images show the same subject captured using both natural light, and a flash. Also shown accompanying each image is the corresponding metadata (taken from Photoshop Elements > File > File Info) - displaying exposure information, lens focal length etc. In the case of the first image the metadata lists the shutter speed as 1/50th of second at F14 with a film speed of 1600 ISO, this combination could result in camera shake and noisy images. The metadata from the second image however lists the shutter speed as 1/60th (this can be increased to speeds of 1/250th of second depending on the camera used / flash synchronization speed chosen) the same aperture but a film speed of only 200 ISO. • Provides additional illumination, and better exposure. • Prevents camera shake in low light, by means of a fixed flash synchronized shutter speed being used (this can be varied according to the camera used). • Negates the need for faster film speed use, therefore facilitating noise free images. • Small apertures can be used (F16, F22 etc) in order to extend depth of focus without the fear of camera shake. The only disadvantage of using a ring flash is that due to the TTL system of flash metering and delivery of light the camera and flash tend to bias the expose for the foreground thus backgrounds tend to look dark / underexposed and can sometimes be seen as unnatural. This can however also be seen as advantageous as any cluttered backgrounds can effectively be hidden from view thus drawing attention to the foreground.